It was inevitable, really. As our lives become increasingly filled with easily afforded electronic aids and means of accessing data and entertainment, sooner or later that trend would result in new approaches to many aspects of the comics medium. Some of the more obvious results of this growing trend are the web comics, blogs, websites and other online points of contact between artists and their audiences. And then there's the ever-growing number of websites and blogs, featuring streamed video and podcasts, which cover the medium and its purveyors, a group which obviously includes this column and its host, World Famous Comics. But there's another side to this growing multimedia investigation of the industry and its practitioners which is often overlooked: DVDs. Now, it's true that this "new" trend actually has its roots in past efforts to capture the life and times of artists using film or video tape, but the increasingly affordable nature of digital and other recording media is making this kind of journalistic work not just affordable, but also profitable for all involved--including fans and aspiring creators who are now getting all kinds of information and insight into the ways that established professionals create their art. All of which means that, again, it was inevitable that I would eventually interview some of the good folks behind those DVDs for this column. Today, it's Greg Jurls of Hero Video Productions, who talks in some detail about his company's latest release, which focuses on the amazing work of David "Kabuki" Mack. Bill Baker: So what is Hero Video Productions, when and why was it created, and who are the main people behind the company? Greg Jurls: Hero Video Productions is a multimedia production company that was created in 2002. We had done a lot of fun and challenging work for groups like NASA, but really wanted to take our knowledge and experience and work on projects that we had a little more control over. My wife Sherri and I are the main forces in the company, but we work with a lot of talented folks including the gifted Damon Crump, who has shot all our documentaries. BB: Why cover comics? Is this the culmination of a life-long dream, simply a logical extension of your own personal interests, or is it perhaps more complicated than that? GJ: I am a life-long comics fan and I was thrilled to see DVDs coming out that would have short interviews with comic book creators as a bonus feature. I was watching the comics piece on the Unbreakable DVD and thought it was cool, but I wanted to see more. BB: So how do you create your DVDs? And do you adopt a different approach for each project, or do you follow the same basic production process for each of them? GJ: The content of the DVDs is largely a collaboration with the artists involved. I always want to have an in depth interview with the artist, but what else we explore is up to what the artist has to offer from their own life. With Terry Moore we got to dive into his music career and hear some of his songs, and with David we talked him into showing a lot of work no one has ever seen, including some very early work. David's interest cover wide gamut and I think we captured that. BB: How do you choose the creators to cover...and what about their work, or their personalities, makes them the perfect subjects for your purposes? GJ: We are looking for people who are passionate about their work and can articulate why they do what they do. So many folks in the comics business have amazing stories about how they got where they are. So far we've been very lucky to document some incredible stories. 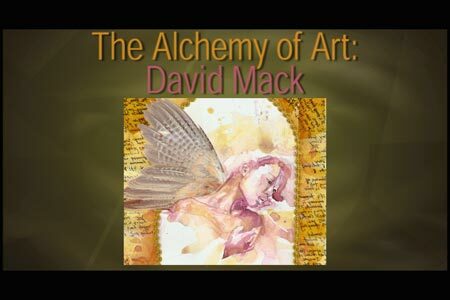 BB: Why don't you tell us a bit about the forthcoming David Mack DVD, and what viewers can expect from it? GJ: We got to spend three full -- very full -- days at David's home and really got some amazing things on camera. We have the most in depth interview David has ever done, David doing book readings, a look at his sculptures, David interacting with other artists, amazing examples of his work before it's printed and tons more. It's a very packed DVD. BB: Will there be any special features, or surprises, included in the Mack release? Any "Easter eggs" or deleted scenes, bloopers, and similar extras in there? 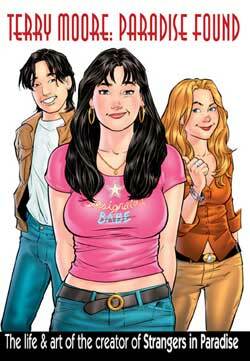 GJ: We will have a "Behind the Scenes" segment like we did for Terry Moore's DVD and it includes lots of funny moments. Damon, our cameraman, kept calling David "Tom Cruise" and eventually David did a very funny Cruise imitation. That will be on there for sure. BB: So, what's next? Do you know who you'll be covering in your next DVD yet, or is it too early to talk about that now? GJ: We have had preliminary talks with a few people, but nothing we're ready to announce yet. If the fans have thoughts on what they'd like to see, send us a note! BB: What do you hope viewers will get from the DVD? GJ: I hope they will be inspired and have a good time watching it. BB: What would you like your work to do for the artists you cover? GJ: I want to show sides of them no one has seen before and truly document who these people are. This is my gift back to an industry I love. BB: How about the comics medium? Do you have any hopes and wishes regarding what the Mack or Moore DVDs might help accomplish for the art form, generally? GJ: I hope we can shine a little extra light on some incredible people who do amazing work. BB: And what about you good folks at HVP? What do you get from doing this work, professionally or even personally? GJ: We're getting to work in a medium we love - video - on a subject we are passionate about - comics. Personally it's has been an honor to work with the folks we have and to have amazing conversations with people we haven't worked with--yet! GJ: You can see trailers and learn more at www.herovideoproductions.com. And tell your local comic book retailer that you want our DVDs. The Alchemy of Art:David Mack (David Mack), Terry Moore: Paradise Found (Terry Moore), and Telling Stories: The Comic Book Creators featuring Geoff Johns, Greg Rucka, Bruce Timm, Howard Chaykin and a host of others, are all available in the October  issue of Diamond's Previews. If you'd like to check out Bill Baker's thoughts on what he's read, seen or been thinking about lately, be sure to head over to specfric.blogspot.com, the new home of his blog, Speculative Friction. To learn more about BB's life and work, head over to www.BloodintheGutters.com, his professional home on the web.